New fiction takes readers to the thrill of adventure and misadventure. Jane Sefc returns to the world of fiction with the release of “Just My Luck: I Came, I Saw, I Got Arrested” (published by AuthorHouse UK), a novel that will take readers to the thrill of adventure and misadventure. 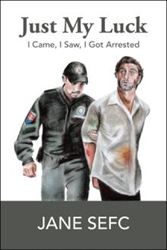 Readers may visit https://www.amazon.com/Just-My-Luck-Came-Arrested/dp/1546288732 to purchase and know more about the book. Drawing inspiration from a daytrip with a friend to a castle where many things went wrong, Sefc shares their experiences through the antics of Gabriel James and Juliette. Gabriel’s weekend started on a great note. Then one small thing set off an avalanche of disasters. A mysterious vase, a broken car, running from wild animals, a stranger knocking on the window, fallen trees, ghosts in a tunnel, an emergency brake – all of this happened within 24 hours. Yet, the only goal he had in mind was to get home safe and sane. It cannot be that difficult, can it? “Just My Luck: I Came, I Saw, I Got Arrested” centers on how a series of little catastrophes started with one wrong decision then problems snowballed. According to Sefc, the book offers fresh and original story based on real-life situations from which readers will find easy to identify with. “Many readers had moments when they had bad luck. Readers can identify with the main character as the funny situations he finds himself in sometimes happen to all of us,” she adds. Through the story, the author hopes to elicit a sense of good mood and promote a relaxing time to anyone reading it. Jane Sefc is a passionate reader with big imagination. She currently resides in Bratislava, Slovakia. She is also the author of “The Books of Norene I,” the first book in her fantasy trilogy. More information about Sefc can be found at janesefc.com.